After witnessing Pokemon Go‘s phenomenal run, more game studios are now also turning to augmented reality (AR) to add that realistic touch to their games. So, are you ready to bust open the head of zombies lurking in your neighborhood? Yes, Walking Dead fans, the dream that you see every waking moment is about to become a reality at last. 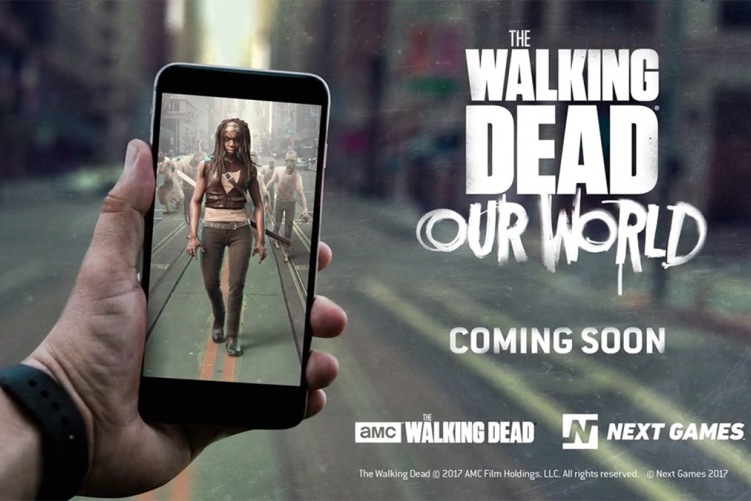 Next Games, the game studio that partnered with AMC Networks to develop all the mobile games for the Walking Dead franchise, is now developing a new AR-focused Walking Dead game. You will soon be able to convert your friendly community into an open space full of lifeless zombies that you can gun down or just hit them in the head with a club. Called The Walking Dead: Our World, this location-based AR game was initially announced back in mid-2017. It’s primarily intended to provide an interactive experience of killing zombies, that too along with the cast of your favorite gory television show of the same name. You’ll be able to turn any location into a zombie apocalyptic land and pick up guns, katanas and even crossbows to hunt down the lurkers and stay alive until they’re all perished. As announced today, alongside its quarterly financial earnings, Next Games has confirmed that the development of its AR Walking Dead game is going as planned. The game already entered the first stage of the soft launch in December 2017 and will soon make its way to testers in the coming weeks. Riding the AR wave, that’s gripped not only phone makers but also game studios, we’ll be seeing a hoard of AR games making their way into our devices. Niantic, the studio that is well-known for making Pokemon Go, is also developing yet another nostalgic game and will bring the magical world of Hogwarts to our real lives. In an official blog post, Next has also disclosed that it is working with Alcon Entertainment to develop a mobile game based on the Blade Runner movie franchise. It has commenced work on the game and will be soft launching the same in the first half of 2018. So, which game are you looking forward to? Slaying zombies or future action sequences? Do let us know in the comments below.